For those of you who haven’t heard about this: The company “Eurocopter Group” has recently been renamed “Airbus Helicopters”, probably as a so called family brand strategy, a step which has been widely discussed in the helicopter world. This re-branding has to be one of the most confusing ones I have ever seen. You take a name that perfectly signifies a gigantic airplane, a “bus in the air” so to speak, and you use it to sell small helicopters. Imagine how much they must have spent on new letterheads and signage? We were thinking of re-branding “Chicken Wings” as well. What do you guys think of “Strasser Entertainment” to more accurately reflect our “family brand”? Mike, how about Airbus Entertainment? I bet comics would sell like hotcakes! Strasser Entertainment definitely sounds more “street”. I read in a french aeronautical newspaper that they change the “temporary name” of EADS to Airbus Group (and by the way Eurocopter to Airbus Helicopter) to use the airbus planes reputation to boost their sales and erase the bad reputation due to the crash of eurocopter chopper last year. They want make a new virginity to the helicopter subvisidiary for the next years. P.S: Sorry for my English as you can read i’m french. @A.Tramp: Not sure one Eurocopter crash would make a difference. They crash every year for all kinds of reasons. There are just so many of them out there flying so many different and often dangerous missions. Helicopters are a little different in that respect than airliners and they will keep crashing even with the new name. You might already find one that crashed since the name change if you looked at the NTSB reports…..
Hmm, I don’t know… I don’t think “Strasser Entertainment” has quite the same “hook” that “Chicken Wings” does, to get a potential new reader interested. “Strasser” doesn’t make the reader do the double-take “wha…Hunh? ?” as they pass by. Oh, and the “short bus” idea is worth more than just a single strip to do it justice. I’d be very surprised if you couldn’t come up with at least 3 or 4 different vignettes. 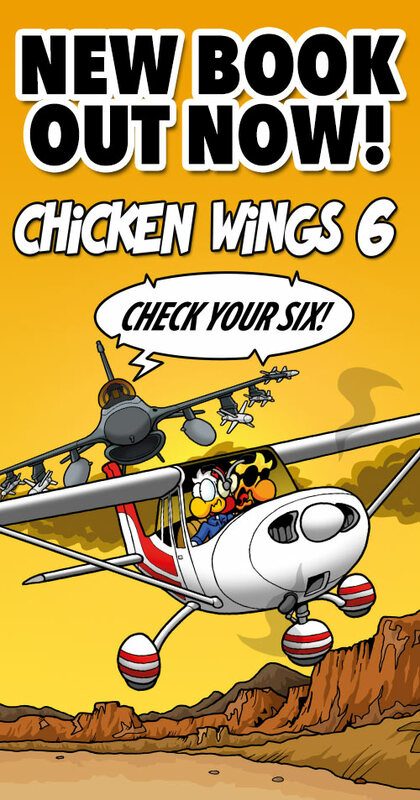 Hot Wings would be more up front, but with Chuck in the pilot’s seat…….No way. Stay where you are, perfect brand. I hope you guys know we were just kidding with the rebranding, right? One could even say that not being serious is part of our business. Strasser Entertainment sounds a lot like the “Hugo Strasser Orchestra”, a german band that makes music to dance for the elder generation like waltzers, foxtrot and the like. Do you want this? A. Tramp, Eurocopter has a better reputation here in the USA than Airbus. Especially with anyone who does maintenance (one older A319 needed rebooting every single time it landed in New Orleans … I know ground maintenance guys who refuse to fly on the things). EADS is the name they use when trying for US gov’t contracts. Ummm… request denied. Keep it Chicken Wings, please. Up Chuck Enterprises?? Oh, me bad! !